The Viper began in 1988 when Chrysler president Bob Lutz recommended building a modern Cobra to designer Tom Gale of Chrysler�s Advanced Design Studios. Carroll Shelby was influential in design also and used the legendary AC Cobra and Shelby Cobra Daytona as his inspiration. At the time, Lamborghini was a subsidiary of Chrysler and they were tasked with casting a prototype aluminum engine block for the Viper based on Dodge�s V10 truck engine. The concept car was originally named Copperhead and first appeared at the North American International Auto Show in 1989. The concept was a big hit and Chrysler chief engineer Roy Sjeoberg and Team Viper got the ok to develop the concept car into a standard production vehicle. In May 1990, Lee Iacocca approved production of the Viper and retail shipments began in January 1992. Generally the Viper R/T 10 1996 convertible was considered a Gen 1 while the Viper GTS 1996 coupe was consider a Gen 2. The heart of the Viper is its V10 aluminum truck engine. Chrysler�s intention for the new Viper was clear, performance is first priority. The SR generation lacked ABS brakes, traction control, door handles, a roof, windows, or any luxury amenities what so ever. Carroll Shelby drove a SR Viper as the pace car in the 1991 Indianapolis 500. Generally the Viper R/T 10 1996 convertible was considered a Gen 1 while the Viper GTS 1996 coupe was consider a Gen 2. In 1996 a coupe model called the GTS was introduced with a lighter more powerful engine. The roof featured raised sections known as the �double bubble� above each seat to accommodate drivers wearing helmets. In 1999 18� wheels and an improved exhaust system further refined the Viper. Perhaps not technically a new generation, the second SR Viper increased horsepower, stiffened and lightened chassis, improved suspension and braking - ABS system introduced in 2001. The Viper GTS was chosen as the pace car for the 1996 Indianapolis 500. A major redesign in 2003 introduced the third ZB generation Dodge Viper. Daimler Chrysler�s Street and Racing Technology Group were in charge of the build. The Viper became more angular and aggressive looking and the engine was enlarged to 8.3 L (505 cid/8,285 cc) that increased output to 500 hp (370 kW) and 525 lb ft (712 Nm) of torque. No 2007 model Vipers were produced. In 2008, power for the Viper increased to 600 horsepower (450 kW) and 560 lb ft (759 Nm) of torque. 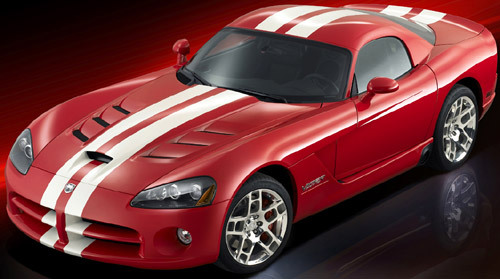 Engine displacement increased to 8.4 liters (512 ci/8354 cc) and modifications like better flowing heads with larger valves, Mechadyne variable valve timing, and dual electronic throttle bodies further tuned the Viper engine. Rev limit increased by 300 rpm due to improved valve-train stability and the new camshaft profiles and valve-springs. The development of the engine was done in conjunction with McLaren Automotive and Ricardo Consulting Engineers. *There were no 2011 or 2012 model year Vipers were produced.